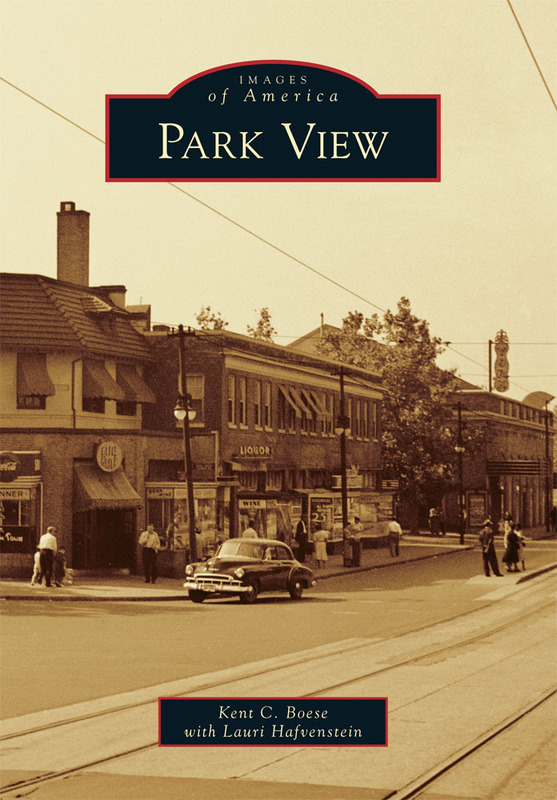 DCRA | Park View, D.C. The property at 723 Morton Street continues to be razed. Below are some recent photos showing the progress. With age and all the wet weather we’ve had this summer, the retaining wall at 3540 finally gave out and I was alerted to safety issues it created by blocking the sidewalk. I immediately contacted DCRA to alert them to this issue, especially as the property has been vacant for several years. 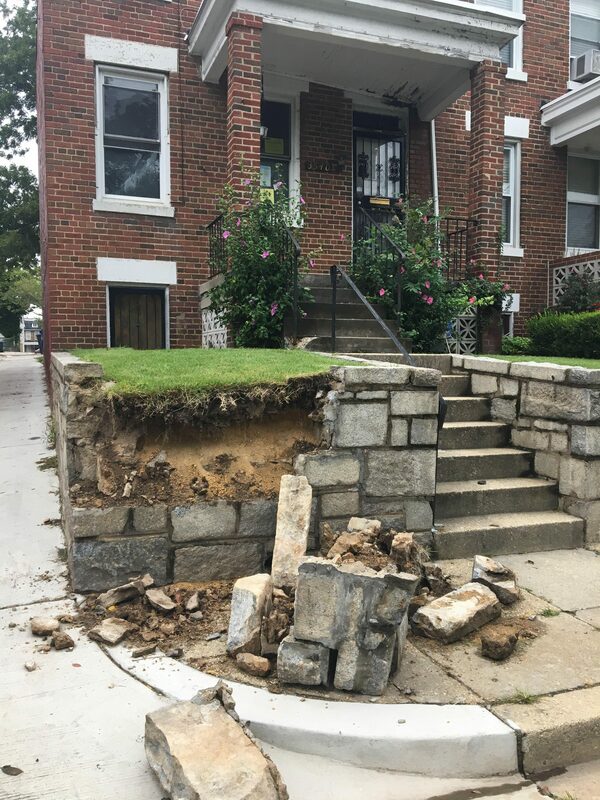 In addition to needing to remove the stone from the sidewalk to restore pedestrian safety, I expressed additional concern that the earth behind the wall could continue to collapse onto the sidewalk if the wall wasn’t fixed. I have to give DCRA credit for addressing this issue quickly. They visited the property yesterday and determined that the site shall be posted for immediate abatement. DCRA’s Abatement team is going today to remove the rocks, and are also proceeding with a contractor to secure the wall. 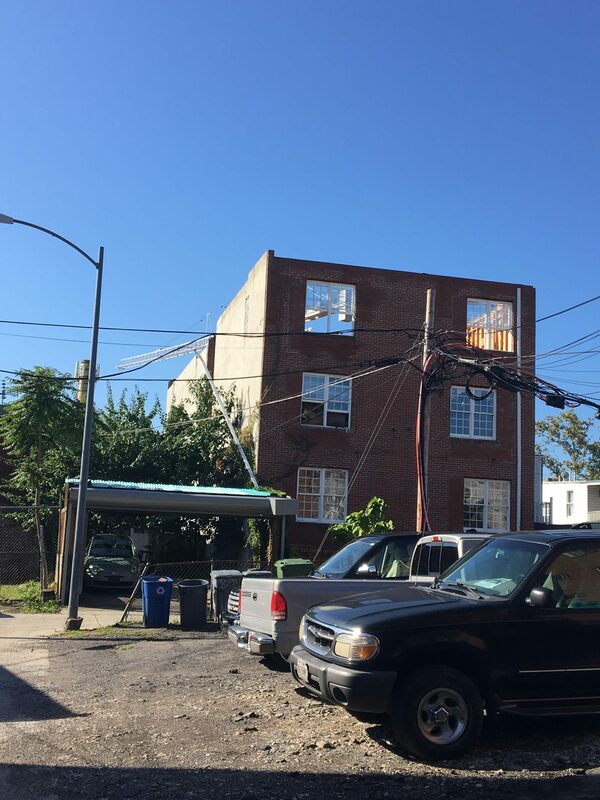 In February 2016, DCRA issued a raze order for 723 Morton Street noting that the structure was unsafe to inhabit and a danger to public safety. Shortly thereafter, the owners filed a case with the Office of Administrative Hearings and secured a Temporary Restraining Order from the D.C. Superior Court which forbidding DCRA from razing the structure. 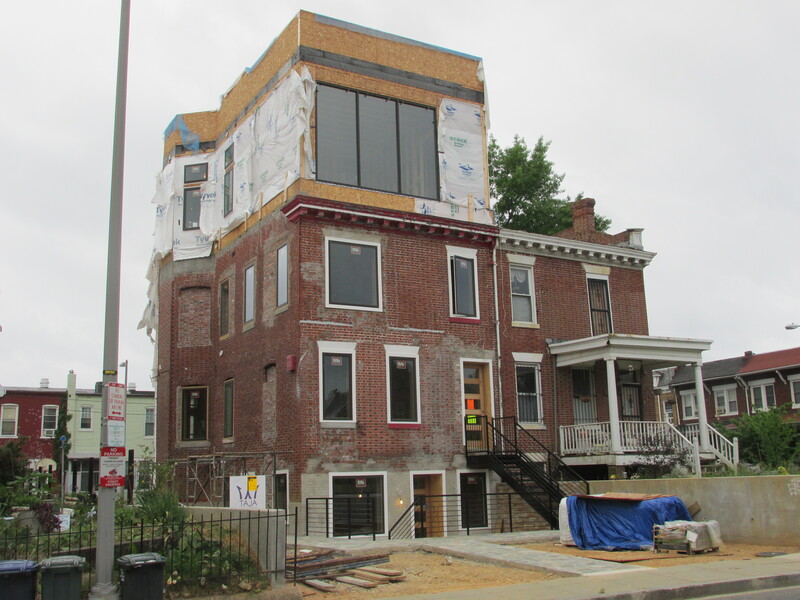 In mid-July, the D.C. Superior Court lifted the Stay on the Order to Raze the Structure at 723 Morton Street, N.W. clearing the way for the structure to be razed. Neighbors may have noticed some activity on the site as the preparation for razing the structure has begun. The property has been a source of concern among neighbors for roughly a decade. The building was constructed as a new eight-unit apartment building without permits for anything beyond a foundation — and does not conform to the RF-1 zone within which it is located. It also exceeds its allowable height. Mayor Fenty, during one of his walks through the neighborhood ordered the building razed during his administration, however DCRA at that time decided to work with the property owner to “bring the property into compliance.” For this to happen, the building would have to be converted into a two-unit building. During the ensuing years, work has progressed on the building off and on, with additional stop work orders and concerns about the structure’s impact on the neighbors. 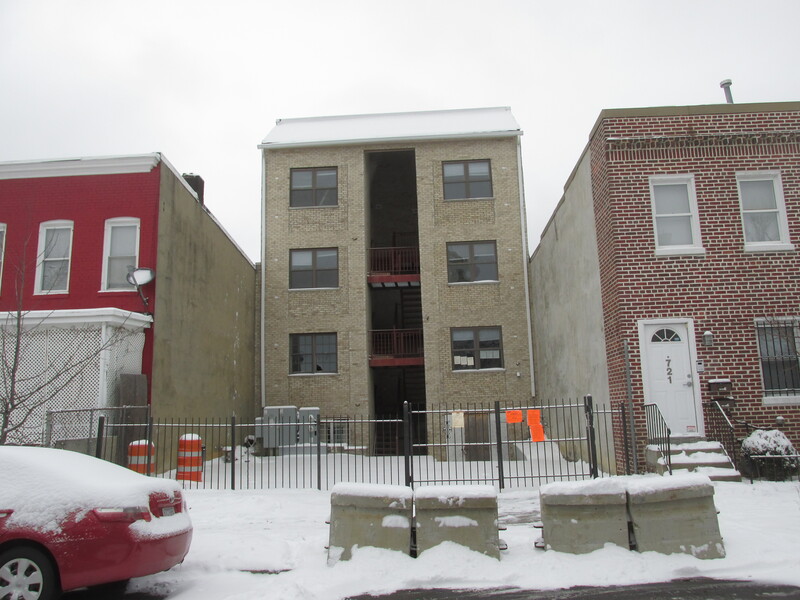 There was also continued concern that the building would not end up as two units, but rather as an 8-unit apartment building without going through the required community and zoning processes. With DCRA getting the green light to raze the structure, it seems that this longstanding issue may be coming to an end. On February 29, 2016, Commissioner Boese testified before the Committee on Business, Consumer, and Regulatory Affairs, focusing his testimony on the Department of Consumer and Regulatory Affairs (DCRA) and its need for improvement. While he acknowledged some positive changes within the department over the past year, there is still much room for improvement. 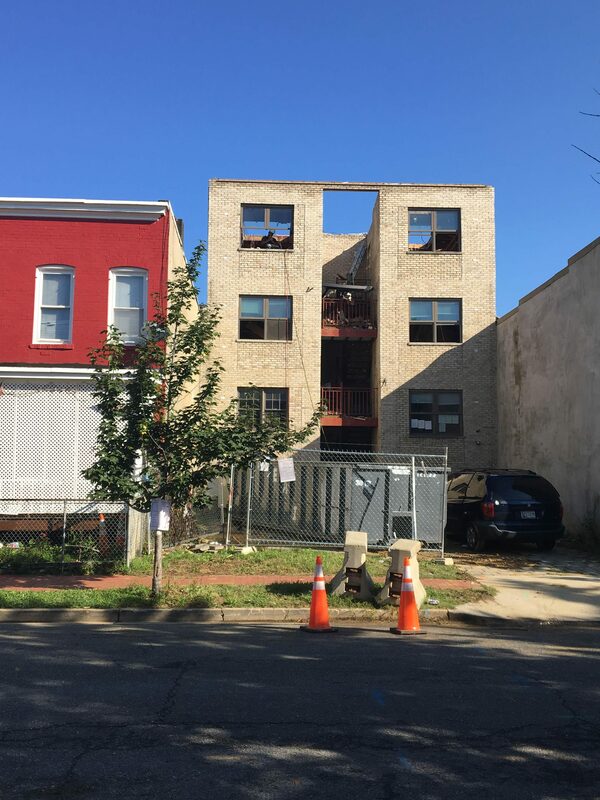 Through his engagement with DCRA over the past year, he has discovered wrongly issued building permits and construction that does not match the plans reviewed in the permitting process among other problems. The strict adherence of zoning regulations. During the hearing, Councilmember Orange asserted that while DCRA can still improve, he didn’t believe that DCRA was as broken or failing to function as some testifying had stated. He referenced the strong development of the District and the fact that DCRA issues over 35,000 building permits a year — using this as an indicator that DCRA is doing something right. Boese countered that a strong real estate market and the resulting increase in development are the cause of the increase in the number of building permits issued — but that this has no relationship to how well DCRA is operating. During the hearing Councilmember Orange often intertwined the issue of DCRA operations and the District’s revitalization and population growth — along with what he felt was his role in it — ultimately clouding the discussion. You can watch the entire hearing here. Commissioner Boese’s testimony can be found between 03:11:48 and 03:52:42. 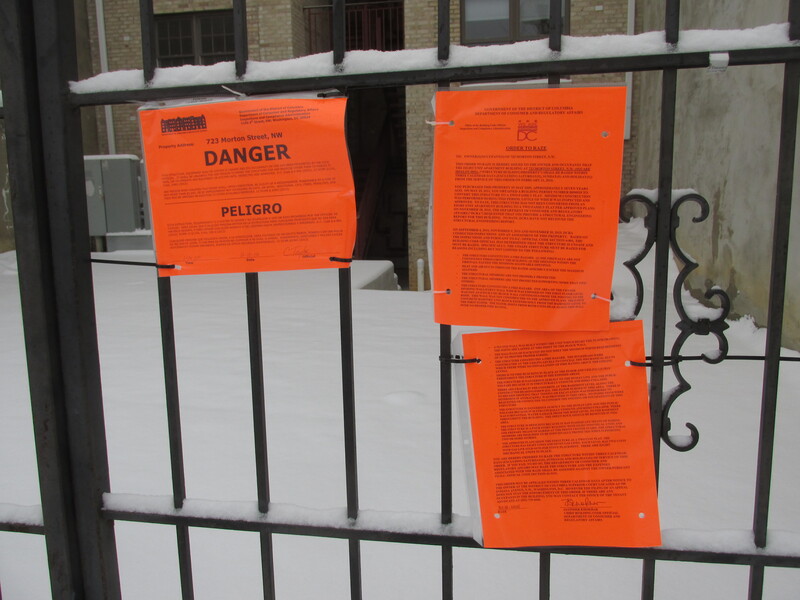 Late last week, DCRA posted notice at 723 Morton Street noting that the structure was unsafe to inhabit and a danger to public safety. The owner of the property has been ordered to raze the building within three calendar days (excluding Saturdays, Sundays, and holidays) or appeal the order. The property has been a source of concern among neighbors for roughly a decade. The building was constructed as a new eight-unit apartment building without permits for anything beyond a foundation — and does not conform to the R-4 zone within which it is located. It also exceeds its allowable height. Mayor Fenty, during one of his walks through the neighborhood ordered the building razed during his administration, however DCRA at that time decided to work with the property owner to “bring the property into compliance.” For this to happen, the building would have to be converted into a two-unit building. During the ensuing years, work has progressed on the building off and on, with additional stop work orders and concerns about the structure’s impact on the neighbors. There was also continued concern that the building would not end up as two units, but rather as an 8-unit apartment building without going through the community and zoning process required. 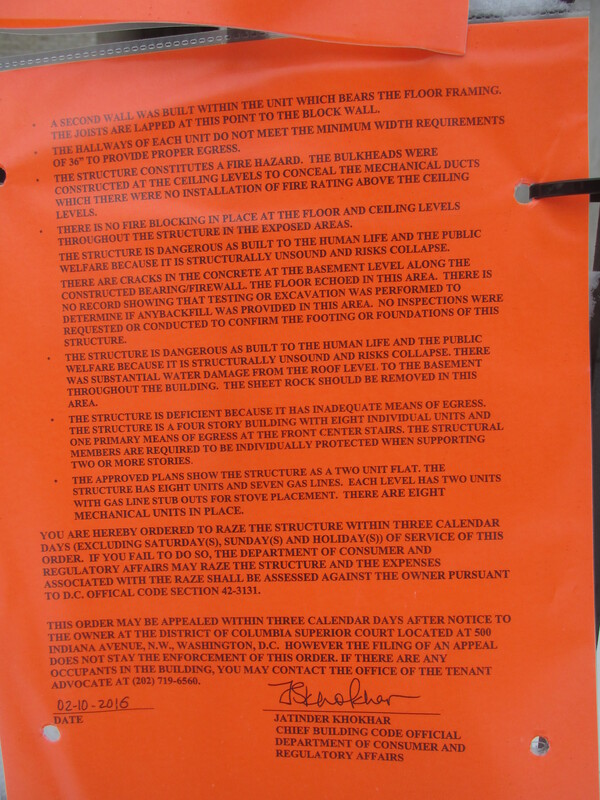 In reading the posted raze notice, a host of issues are listed — among them an inadequate firewall, deficient stairwells and exists, considered to be structurally unsound and at risk of collapse, and seven gas lines & eight mechanical units though only being approved for two units. The raze notice is below for those interested in reading in detail. What’s Going on at 454 Park Road? 454 Park Road, NW, inactive as DCRA reviews permits. Over the past several weeks I’ve received several questions wanting to know what’s going on with 454 Park Road, NW. Those familiar with the property will know that permits to add a third story to the building were originally applied for back in June 2014. The developer, Taja Investments, proceed to pull permits and begin their redevelopment of the property. In February 2015, Councilmember Nadeau’s office reached out with a question concerning a complaint they received about the property that was the result of the yard being dug out and lowered to street grade. 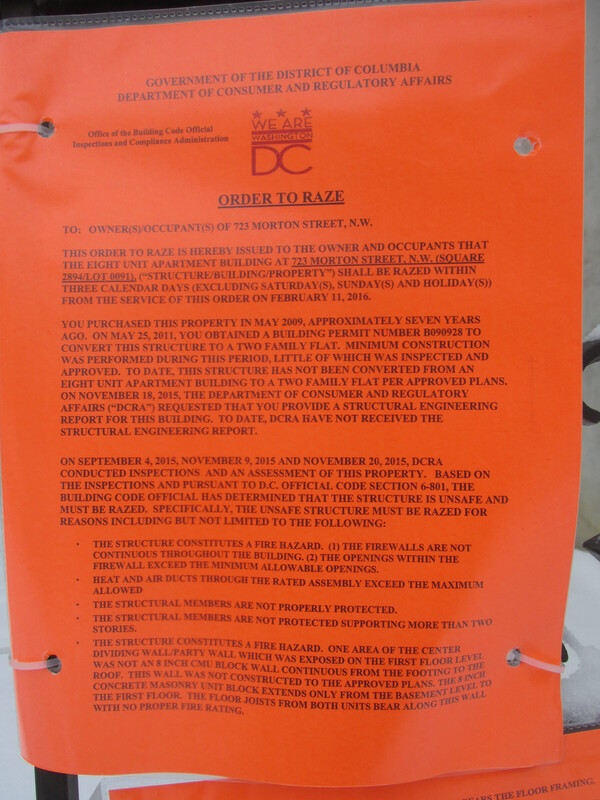 Later that month I began to work with DCRA when unpermitted popups began on Princeton Place and other areas nearby. 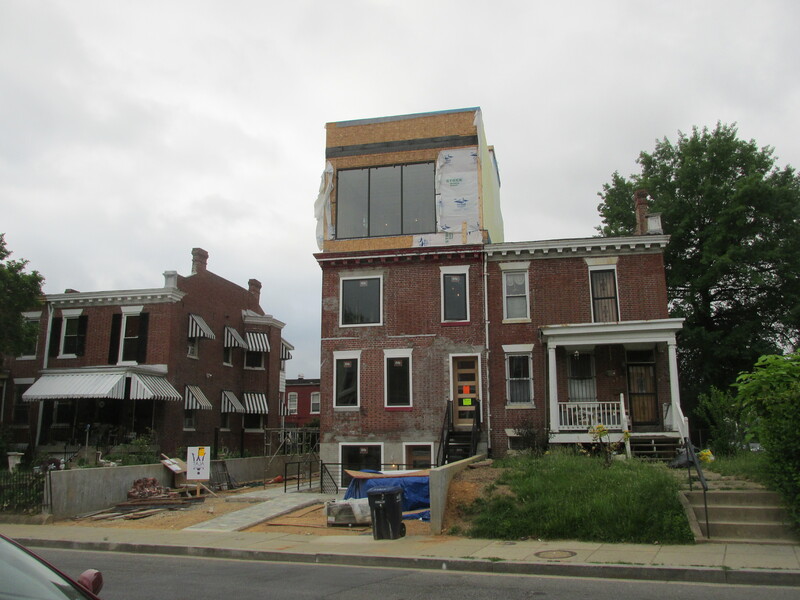 In passing, I asked DCRA to explain how height was measured at 454 Park Road — the reason being that without the front yard the building appeared to be much taller than it otherwise would be, and such construction seemed to be contrary to the Zoning Code. 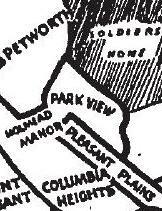 What followed was a full review of the plans in order to explain how the property complies with DC’s zoning regulations. The simple question on height — which is answered in that height is measured from the center of a building where it meets the ground at the time the permit is issued — has morphed into a much bigger issue. Apparently the construction and building at 454 Park Road are not entirely in sync with the plans that were reviewed by DCRA when the permits were issued. This has triggered a broader review of the project. 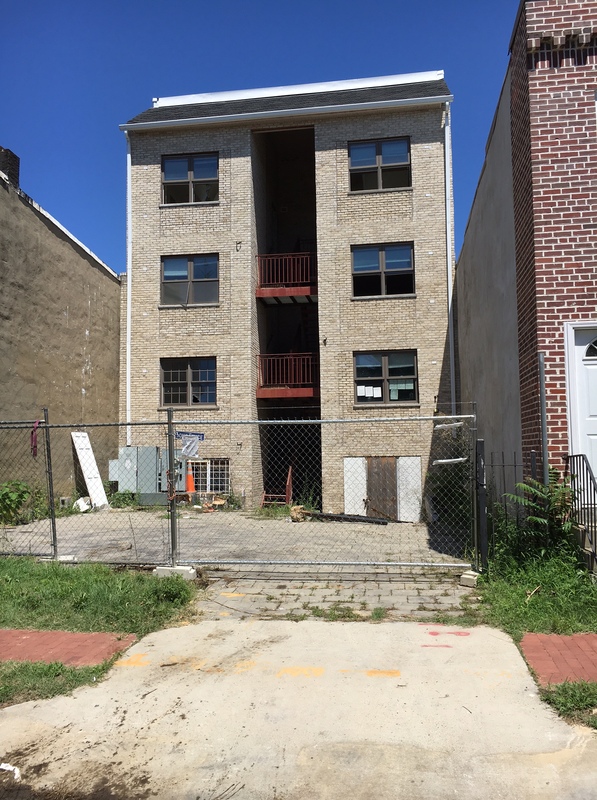 Revision to permit number B1403570 to include excavation of front, side and rear yard, new areaway at front and rear, penthouse, fence and rooftop deck. changes to 3rd floor addition. Revision to include changes to previously approved MEP Plans. Permit was approved for 3 units change to 2 units. The developer could seek a zoning variance and hope that they would be allowed to have a four-story building. It is too early to tell how this will end or what recommendations DCRA may make. However, I feel strongly that zoning variances should be considered and settled prior to construction, not retroactively pursued to permit construction that otherwise would not have been approved. On Thursday, February 26, Councilmembers Brianne Nadeau and Vincent Orange hosted a Ward 1 town hall meeting for community members to ask questions related to their oversight role on the Committee on Business, Consumer and Regulatory Affairs. The agencies present at the town hall were Employment Services, the Department of Consumer & Regulatory Affairs (DCRA), the Public Service Commission, The Alcoholic Beverage Regulation Administration (ABRA), and the Department of Small and Local Business Development (DSLBD). There were roughly 60 people in attendance at the start of the meeting, including Councilmember staff and ANC commissioners. After opening remarks, Councilmember Nadeau brought the meeting to order. Questions had to be submitted in writing, allowing like questions to be grouped together. No questions were submitted for Employment Services, the Public Service Committee, or the Department of Small and Local Business Development. Residents were primarily interested in DCRA and ABRA. The questions for DCRA were first — and none of them were positive. Repeatedly residents and ANC Commissioners spoke about DCRA’s unresponsiveness and failure to address issues. ANC 1A06 Commissioner Patrick Flynn stated that he had never had a positive experience with DCRA, whether dealing with them as a resident, small business owner, or Commissioner. He continued by sharing an experience with a problem property in his community which had squatters living in it and frequent calls for service — a situation that in the end resulted in MPD taking charge after the property was set on fire. ANC 1C05 Commissioner Alan Gambrell asked for clarification on how building permits were issued for additions larger than allowed based on square footage requirements, and more importantly for justification on how the square footage was measured and formerly measured areas became areas not measured when calculating additions. In every instance, DCRA’s response to the community was wanting. Whether responding to the resident who’s house was damaged by the development next door, or the gentlemen wanting to know what protections and assistance exist for residents when their building contractors don’t deliver on the project they’ve been hired to do, DCRA was unable to satisfactorily respond to a single question without redirecting to a phone number or asking the person to stay after the meeting for a personal conversation. After questions were finished for DCRA, easily half of those in attendance left the meeting. Much less time was devoted to ABRA, and the questions that were asked were more of the type of residents seeking to know more about a process. Unlike the experience with DCRA, ABRA Director Fred Moosally answered questions well and was clearly knowledgeable of his agency and its operations. One of the more interesting questions that was asked of ABRA was why citizens returning to the community after serving a sentence were banned from applying for a liquor license for 10 years. The concern was that 10 years was excessive, which Director Moosally stated could be revisited to see if the duration was still deemed appropriate to the original concern. Another interesting question was asked by Denis James of the Kalorama Citizens’ Association. James questioned the appropriateness of MPD officers serving on Business Improvement Districts (BIDs), and how that association may bias the ABRA Board during a hearing. Overall, the general impression from the meeting is that DCRA has lost the community’s confidence. I also doubt that there will be any concrete improvements that come out of the meeting … but then again, only time will tell.